To meet today’s complex and ever-changing business demands, you need a solid foundation of compute, storage, networking, and software resources that is simple to deploy and can quickly and automatically adapt to changing conditions. You also need to make full use of broad expertise and proven preferred practices in systems management, applications, hardware maintenance, and more. The IBM® Flex System p270 Compute Node is an IBM Power Systems™ server that is based on the new dual-chip module POWER7+™ processor and is optimized for virtualization, performance, and efficiency. The server supports IBM AIX®, IBM i, or Linux operating environments, and is designed to run various workloads in IBM PureFlex™ System. The p270 Compute Node is a follow-on to the IBM Flex System™ p260 Compute Node. 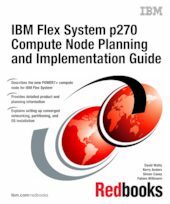 This IBM Redbooks® publication is a comprehensive guide to the p270 Compute Node. We introduce the related Flex System offerings and describe the compute node in detail. We then describe planning and implementation steps including converged networking, management, virtualization, and operating system installation. This book is for customers, IBM Business Partners, and IBM technical specialists who want to understand the new offerings and plan and implement an IBM Flex System installation that involves the Power Systems compute nodes.